Read an article about Yasmany Tomas from before he signed with the Diamondbacks, and most of them will say something along the same lines about his profile. The power was thought to be real, maybe a 70 on the 20-80 scale; the contact skills might be uncertain; and while the arm could potentially be a plus, it was far from certain where he he’d fit on the defensive map. That’s evident, really, in just how those reports described his position. In September, Kiley McDaniel listed him as a left fielder. In October, Baseball America’s Ben Badler said that he “had the defensive attributes to fit in either corner spot.” After Tomas signed with Arizona, Keith Law also talked about him as a corner outfielder. Dave Cameron even noted that “some teams felt that he profiled more as a DH.” Other than a few tossed-off occasional mentions that he’d played some small amount of first and third earlier in his youth — 30 games at third in 2008, primarily — just about no one expected him to be an infielder. Except for the Diamondbacks, that is. Due in part to their own evaluations of him, in part due to a crowded outfield, and in part due to a third base situation unstable enough that longtime second baseman Aaron Hill played his first games since 2005 at the position last year, Arizona almost immediately announced that they’d like Tomas to play third base. It’s March 11, so we’re not going to pretend that we’ve seen enough of Tomas to make a determination as to whether he can handle the position or not. But we haven’t seen nothing, either, and considering where he came from, it’s the first time most of us are able to see real actual game video of him. 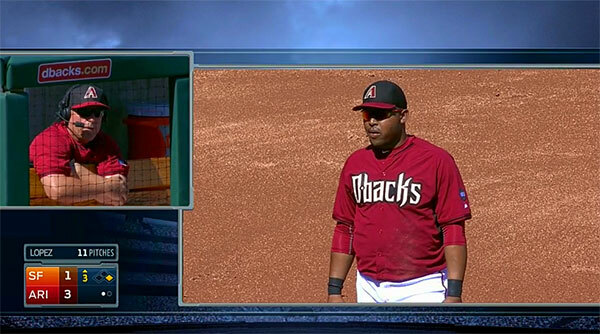 Considering how the Diamondbacks are set up, where he ends up is going to have a ripple effect on the rest of the lineup. Scouts not worried about Tomas’ arm, even though he has skipped throws. More a lack of lateral quickness, other athletic-type plays at 3B. So with the full caveat that this isn’t really a full scouting report — it can’t be, given that he’s played only four games at third and only one of the Arizona spring games have been broadcast — let’s see what we can see. After all, if even the manager is talking about how he needs to improve, then it’s not just a story to those of us desperate to talk about something that isn’t Yu Darvish or Cliff Lee or Marcus Stroman. …where Hale indicated he’s “more athletic than people give him credit for,” but admitted that there would be a point where they’d have to decide if Tomas would end up at third or the outfield. Not bad! Good reflexes, got the glove up, displayed a strong arm. But also, not great, because the play wasn’t made. 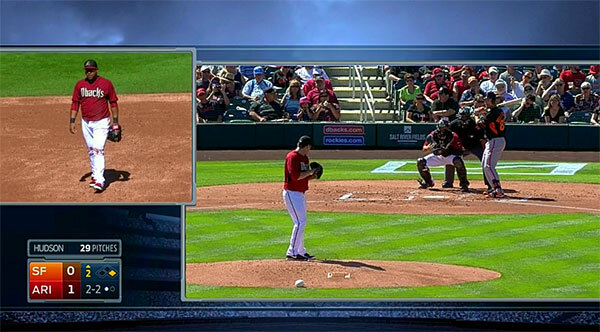 As the D-Backs broadcasters noted, the arm isn’t a problem, but the hands might be. Less good! Tomas looked stiff and never made a clean play on the ball, leading to an error. Now, let’s stipulate how completely unfair this is: Tomas had only two balls hit to him during this game, and since it was the only televised game, it’s the only two sources of video we have. In this enormous sample size of “two,” he’s 0-for-2. This is unfair. In an earlier game, he reportedly made some nice plays, including coming in to bare-hand a ball and make the play, though there was a bobble on another ball that day as well. Tomas, certainly, will get more chances to prove himself over the next few weeks, and perhaps even find himself with Triple-A Reno to continue working if the D-Backs think that there’s enough third base potential there to keep working on. But let’s say that it doesn’t, because there’s more than ample evidence — based on the scouting reports we know of him coming to America, the scant video we have, and the opinions of his own manager — that it won’t. What then? You could say that the Diamondbacks should just let him play at third, even if it’s ugly, because the 2015 season is unlikely to matter for them. They lost 98 games last year. We’re giving them just a 3.3% chance of making the wild card game. Their new GM is living with their recently-fired previous GM. It’s a transitional time in the desert, to say the least. Maybe so. But then again, for all the crowd in the outfield, there’s no one irreplaceable, and they have a ready-now third base prospect in Jacob Lamb, 24, who homered off Barry Zito and Eric O’Flaherty yesterday. (Tomas hit one as well, off Sonny Gray.) Last year, he had a 162 wRC+ in Double-A; Kiley referred to him by saying he had “60 raw power from the left side and he should be able to stick at third base long-term,” as well as placing him in the lower tier of the Top 200 Prospects. It’s not that Lamb is a guaranteed star; it is that he’s the type of young player a rebuilding team like Arizona should want a look at. Of course, tough decisions would need to be made in the outfield, assuming Tomas went to left. Mark Trumbo is moving to right, and we all know what he is, an OBP-crater with little defensive value who is a big source of power when he can get to it. A.J. Pollock just put up a pair of three-win seasons in center despite missing time with a broken hand, thanks to a good-enough pairing of power, speed, and defense. Ender Inciarte came out of nowhere to add elite defense and valuable base running; David Peralta came from further away and had a 110 wRC+ in limited time. There’s even still veteran Cody Ross kicking around, though he’s been injured for most of the last two years. It was never likely that Tomas was going to stick at third, and while it’s far, far too premature to call it done, little we’ve seen so far indicates that the initial scouting reports were wrong. If he ends up in the outfield, what the Diamondbacks might have is a powerful righty hitter with questionable plate discipline who briefly tried to make it work at third base. If that sounds familiar, it should; back in November, when Jeff Sullivan tried to come up with player comps, Trumbo was high on the list. Arizona has to be hoping that Tomas ends up being more valuable than the intermittently useful Trumbo. If he is, it’s probably going to be on the outfield grass, not the infield dirt. We hoped you liked reading Early Returns On The Yasmany Tomas Third Base Experiment by Mike Petriello! 3B? More like Tripple D’s!